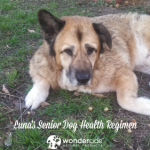 For those of us lucky enough to have a senior dog in our lives, you know that they love with all their hearts. But what do you get your beloved pet to show her how much she means to you? Sure, you could snag her another toy, but you should also think about getting her on the right track to live out her golden years at her very best. Diet is the cornerstone of health for people and pets alike. Aging dogs burn fewer calories than those in their prime, so it’s more important than ever that you’re not feeding your pup fillers. Look for high-quality, meat-centric formulas in commercial foods, or feed a biologically appropriate homemade or raw diet with guidance from a holistic veterinarian. 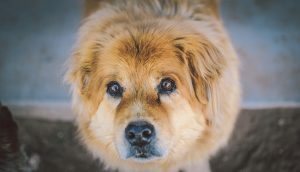 Older dogs may need a little extra boost when it comes to meeting their nutritional needs, and pet owners have seen improvements in their dog’s conditions using everything from fish oil to turmeric to raw apple cider vinegar. Our favorite add-on is Fidoplex, which enhances the functions of joint and connective tissue. Elderly pups are more sensitive than young ones, and things that didn’t bother them in their youth may become issues later on. Whether yours has developed an allergy or started reacting to commercial flea & tick preventatives, now is the time to rethink the toxins in her life and make sure she’s living as naturally as possible. The first step? 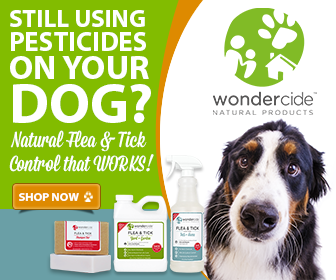 Dump the pesticide-based preventatives and switch to Wondercide’s natural flea & tick control. Your canine companion may not be running this year’s marathon, but she doesn’t need to resign to life as a couch potato, either. Slow-paced daily walks and physical-therapy-type exercises like balance boards will maintain her strength so she can keep on keeping on through the years. Dog products have come a long way from collars and leashes to include a plethora of helpful items for senior pets. A good staple for your older dog is an orthopedic bed for comfort. Other accessories that counter arthritis include a sling-based leash (GingerLead) and non-slip nail grips (ToeGrips) that prevent slipping on hardwood and tile floors. Dental health should be a priority for dogs of every age, but it’s especially crucial for seniors, who are at a higher risk of getting oral infections or contracting illnesses caused by poor dental hygiene. Follow our 4 Steps to Dog Dental Health (which actually includes diet) so your dog can maintain those pearly whites forever.